With the holidays approaching, it’s time to stock up on gifts for your children that will both come in handy and that they’ll love. When it comes to gift shopping for a swimmer, there are plenty of items that will help make their swimming experience more enjoyable. We’ve put together the top 5 gift ideas that you can buy for a swimmer this holiday season! The best gift you can give to a swimmer this holiday season is the gift of swimming itself! Signing up your child for swimming lessons with B & C Aquatics gets them out of the house and in the pool this winter season. This will make any swimmer happy and give them exercise that’s hard to get in the colder months! With children growing as fast as they do, bathing suits constantly need to be replaced when they are eventually outgrown. A new, stylish and well-fitting bathing suit can help your child feel more comfortable and confident in the pool, making for a great gift idea! 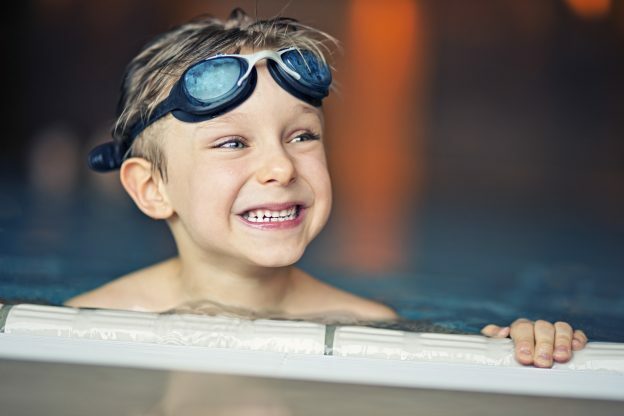 Children have a tendency to open their eyes in the pool, and without a quality pair of goggles, this can cause discomfort. Getting your child a new pair of goggles will help them avoid chlorinated water entering their eye and help their performance in swim lessons as they feel free to open their eyes in the pool. Backpacks are perfect for carrying around swim supplies to and from the pool. Not only that, they are also versatile and can be used in many different activities outside of swimming to get tons of use and make for a valuable gift! Swim Caps are a great gift for swimmers with longer hair. It helps keep the hair out of their face and allow for less distraction in the pool, as well as keeps goggle straps from pulling on hair which can cause discomfort.